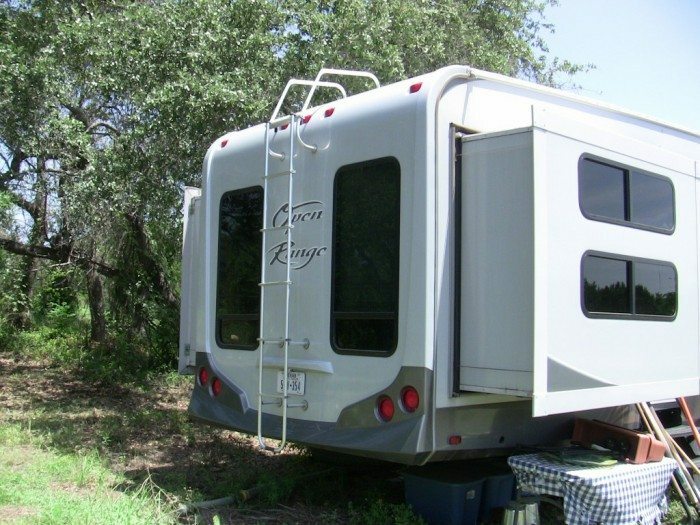 Have you ever heard somebody say “well, it gets you off the ground” when talking about an RV? 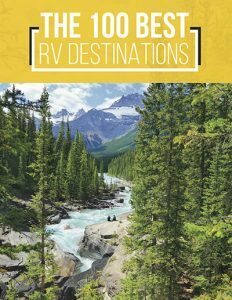 That common sentiment about RVs seems to be imply that best part about them is that you no longer have to sleep on the ground when camping. While that may be true, for me sleeping on the ground never bothered me as much as getting rained on. For that reason, I think one of the very best things about having an RV is not getting off the ground, but having a roof over my head! A good, solid RV roof is an incredibly valuable thing. Therefore, understanding your roof, and how to maintain it, is important. Let’s take a look at some RV roof basics. There are three different kinds of roofing material used on an RV. Rubber – Probably the most common material for an RV roof. Rubber roofs come in two different types. An EPDM RV roof (Ethylene Propylene Diene Monomer), or a TPO RV roof (Thermal Poly Olefin). Each type of RV rubber roof requires slightly different maintenance, so be sure to consult your owner’s manual for the proper way to care for your roof. Fiberglass – This type of RV roof is hard to the touch, and is a bit more rare than a rubber RV roof because they add cost and weight to the RV. Having said that, fiberglass RV roofs are more low maintenance than rubber RV roofs, which makes them preferable for some. Aluminum – Perhaps the rarest material used for RV roofs is aluminum. It’s fairly unlikely that your will find an RV aluminum roof. Like fiberglass, aluminum adds weight to the RV. However, an aluminum RV roof has fairly low maintenance. It’s important to understand the type of material your RV roof is made of. Once you know the type of roof you have, you’ll be able to do a visual inspection of your roof on a frequent basis. 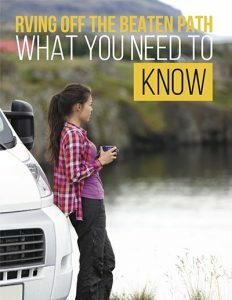 From there you’ll be able to determine what type of maintenance it will need, how often it will need maintenance, and what type of RV roof products you’ll need to perform the maintenance. RV roof maintenance is important. Regardless of the type of RV roof that you have, and depending on how often and in what conditions you use your RV, you’ll need to apply RV roof caulk at least once a year to seal your RV roof. One example type of RV roof caulking is the popular sealant Dicor, available at Amazon. At roughly $10 per tube, it’s an affordable RV roof repair option. RV roof caulk prevents water from entering your RV, and ensured that any equipment on your roof is secured properly. Use RV roof caulking around roof vents, skylights and any other areas where something has been secured to the roof. Always be sure to consult your owner’s manual or the manufacturer to determine what type of RV roof caulk they recommend. There are different types of caulk available depending on the specific application needed. Additionally, the climate you live in may dictate the type and application of caulk. Again, be sure you check with your RV’s manufacturer for their recommendations. To give your RV roof a new shine, you’ll need to apply a new RV roof coating. A common material used to re-coat an RV roof is called RV Liquid Roof. While rubber is the most common material used on RV roofs, due to its low weight and relatively low cost, an RV rubber roof does require more maintenance than a fiberglass or aluminum roof. The maintenance is not difficult, but it’s important to make sure you have the right materials. Most likely at some point during an RV rubber roof’s life, it will need a new RV roof coating. The protective layer on an RV rubber roof becomes chalky and wears off slowly over time. This is normal. 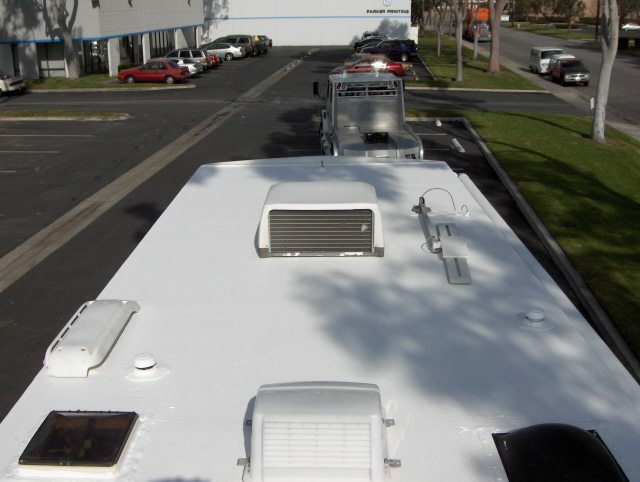 RV liquid roof is an EPDM coating which you apply by painted onto the roof of your RV. 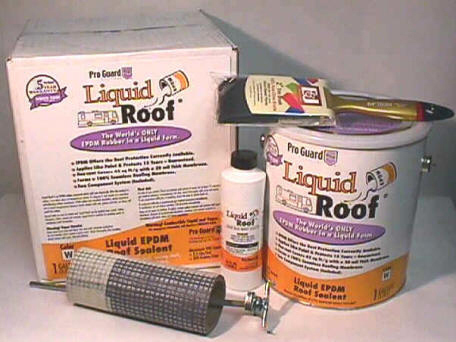 Liquid roof provides a protective barrier from the sun’s UV rays and from rain and debris. Protecting your roof from these elements will prolong it’s life, and in turn, prolongs the life of your RV by preventing water damage. A low hanging branch at a campground, or an over-zealous scrubbing of your RV roof, can add a blemish to your roof. Despite proper care and maintenance, there may come a point where you need to do some repair on your RV roof. RV roof patch, also referred to as RV roof tape, is something that you should add to the “Just In Case” tool kit in your RV. If something happens to cause a rip or tear in your RV roof while you are out for a trip, you’ll be glad you have some RV roof patch on board. RV roof patch is an easy to apply, water-resistant patch that uses adhesive to stick to your RV roof, sealing up the rip or tear. 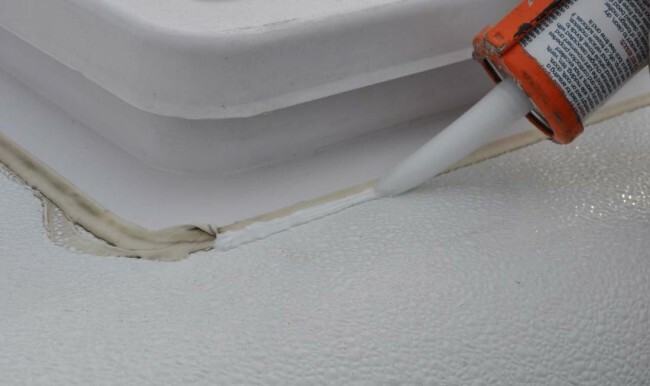 These patches create a permanent fix on your RV roof by sealing the rip or tear and allowing it to stay flexible for long periods of time so they will not peel away unexpectedly. Eternabond is a common brand of RV roof patch which can be found in home improvement stores, RV supply stores, and on Amazon. If you store your RV outdoors in the winter, or if you store your RV under trees or in a highly dusty area, you may want to consider an RV roof cover. An RV roof cover is a great way to keep dirt, debris, snow and sun off of your RV while you are storing it. Best of all, a good quality cover is resistant to tears and allows any moisture that accumulates to evaporate quickly. Even though a good cover will allow moisture to evaporate, mildew can still grow on your RV under the cover because the cover prevents light from getting to your RV. 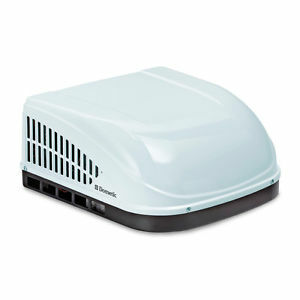 Adding to the mildew concerns, an RV roof cover will also prevent airflow from circulating around your RV. For this reason, it’s important not to keep a roof cover on your RV for too long. Keeping the cover on your RV during a storage season is fine, but any longer than that and you may find yourself with a “growing” mildew problem. 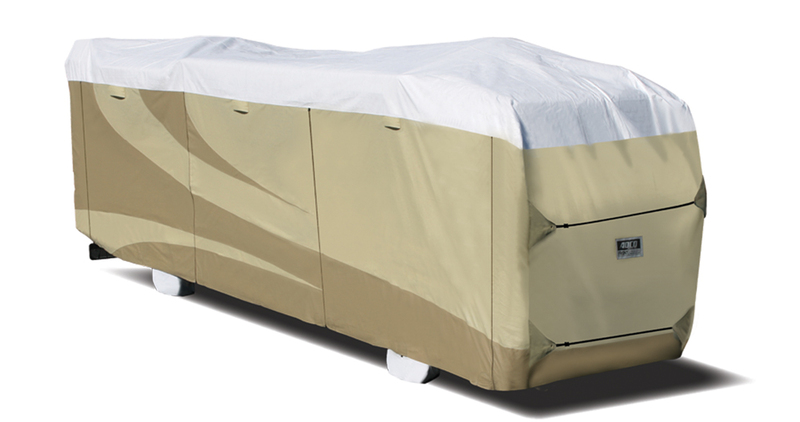 RV roof covers come in several sizes, so be sure to do some research to determine the best kind of cover for your RV. Warning: Avoid using a traditional tarp to cover your RV for long periods of time. Tarps allow absolutely no air movement or breathability, so they will cause mold and mildew issues on your RV in a short amount of time. Tarps work fine as a short term solution if part of your RV is exposed to the elements, but keeping them on for long periods of time is not recommended. We mentioned the benefits of having a roof over your head, but another benefit of having an RV is probably sitting on top of that roof – an RV roof air conditioner. On those hot, summer days, when you’ve spent the day outside swimming, biking and playing catch, it’s quite a luxury to return to a nice, cool RV. RV roof air conditioners are a necessity in many climates, and because they are doing a hard job of cooling a hot area, the air conditioner is probably the most power-hungry appliance on your entire RV. Because air conditioners use so much energy, it’s important to keep them in top working order so they don’t use more resources than necessary. Like your RV roof, your RV’s air conditioner requires some yearly maintenance. It’s important to keep the air conditioner clean so that it has a long and “cool” life. If the coils or the louvers on the air conditioner are dirty, that can cause the air conditioner to have to work harder than normal, which will shorten the life of the air conditioner. Finally, when you are inspecting your RV roof, you’ll want to inspect your RV air conditioner’s shroud cover to make sure that it is in good shape. Cracks in the shroud can lead to dirt and debris entering the air conditioner, which will limit the efficiency of the air conditioners ability to cool your RV. Some cracks in an air conditioner shroud can be patched, while others may require you to replace the shroud completely. Throughout your RV are several roof vents. These vents open to allow hot air, and sometimes moisture, to escape from the RV. Traditional roof vents have a manual crank that is used to raise and lower the vent cover. An upgrade to these roof vents may be RV roof fans. These fans fit into the same size opening as the existing roof vent, but they use 12-volt power to push air out more efficiently or to draw air in as needed. 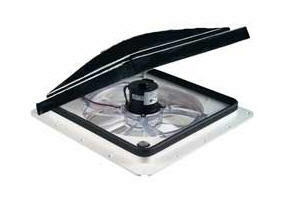 One of the most popular RV roof fans is the Maxxair 12V Roof Top Fan and Vent, a well-known model that is widely considered to be one of the best RV roof fans on the market! Many RV roof fans come with automatic thermostats which open & close the vent, along with turning the vent fan on or off, depending on the temperature setting on the fan. These fans are a great way to maintain a comfortable temperature in your RV without having to use traditional fans or a power hungry air conditioner. If you’re lucky enough to have an RV equipped with an RV roof rack, you have a great place to store extra equipment while you are traveling. Luggage, bikes, your mother-in-law (! ), all kinds of things can be transported on your RV’s roof if you have the right equipment. As with other items on your RV roof, make sure your RV roof storage rack is sealed around the area where the rack is secured to the roof. Also, be sure the rack itself is secure and in good condition before attaching anything to it. If your RV isn’t equipped with a roof rack you can purchase an aftermarket RV roof rack to install yourself. Surco makes a universal roof rack model, available on Amazon. Always be sure to use caution and the proper materials when securing anything to your RV roof. If you’re going to be doing any maintenance on your roof, or storing anything on it, you’ll need to be able to get up there. 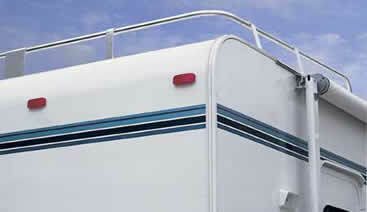 Many RVs come equipped with an RV ladder so that you can access the roof. RV ladders are most often found on the back of the RV, but depending on what type of RV you have, they could also be found on the side, or even the front of the RV in the case of some travel trailers. An RV ladder is attached to a sidewall on your RV, as well as to the roof, and, you guessed it, you’ll want to make sure these connecting points are secure and sealed with RV caulk. If you have multiple areas of damage on your RV roof, or you have one area of damage which is so extensive that it has compromised the rest of your RV roof, you may want to consider replacing your RV roof completely. 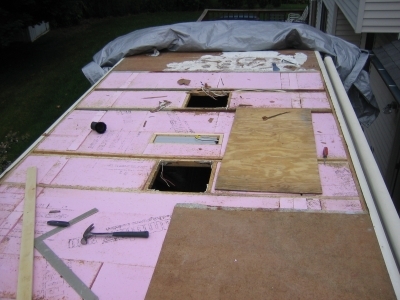 RV roof replacement is a big job, but the materials and tools are readily available if you wish to do it yourself. Replacing an RV roof requires you to remove the awning and any equipment that is secured to the roof of your RV. You then need to remove the existing roof membrane and replace any plywood underneath the old roof membrane that has been damaged. You then adhere the new roof membrane to your RV roof before sealing the edges, replacing the items from the roof, and sealing the seams around the roof vents and antennas. As with any piece of RV roof maintenance, if you aren’t comfortable with tackling the job on your own, consult a local RV service center for estimates. 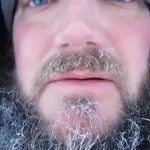 Now get out there and inspect and seal that RV roof! Please share this article with anyone you know who could use a quick education on RV roofs!